A few days ago, a friend of mine showed me her recipe for a surprisingly simple mango cobbler. It’s quick to throw together and only requires 4 ingredients—fruit, cinnamon, butter, and boxed cake mix! And the final product is SO delicious. With that recipe in mind, I was inspired to add my own Fourth of July twist. 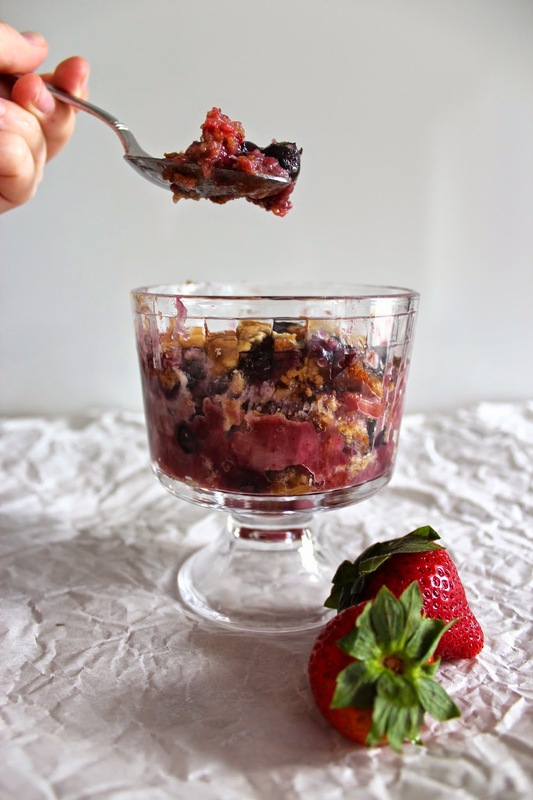 If you have hectic plans for the Fourth, and are in need of a last minute recipe, this Red, White & Blue Cobbler is the one for you. 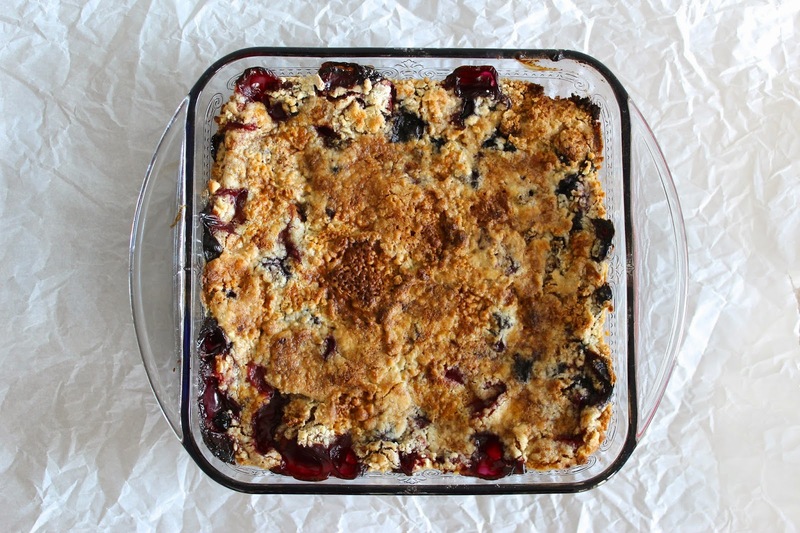 So how does a box of dry cake mix transform into cobbler? The key is a very thick layer of fruit. After baking for an hour, the fruits’ natural juices transform the dry mix into cake! On the other hand, the butter creates this crisp, crumbly topping that’s to die for. All in all, this dessert is kind of magical. And the great thing is, this recipe could work with pretty much any cake mix you’d like. The original recipe calls for yellow cake mix, however, I used French Vanilla for the patriotic theme. But if you’re feeling extra creative, you could try a mix of flavors—tropical fruit with a coconut flavored cake mix would be great, for example. Baking is all about creativity, flexibility, and fun in my opinion! Ok, so here’s how it works. 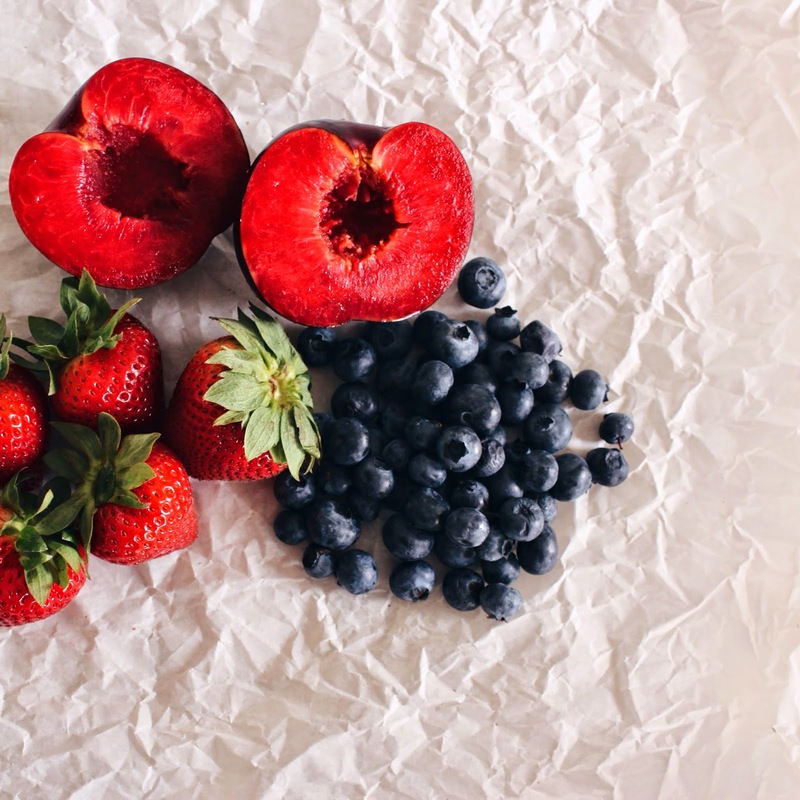 First, chop up the strawberries, blueberries, and plum into bite-sized pieces. Make sure that the skin is peeled off of the plum. Then, evenly place a few pats of butter on the bottom of an oven safe baking dish. On top of the butter, sprinkle a fairly thick layer of dry cake mix. Above the dry mix, pour on a thick layer of the juicy, chopped fruit. Next, sprinkle generously with cinnamon. ...and sprinkle with a bit more cinnamon. And that’s absolutely it! After 1 hour in the oven at 350 F, you’ll have a bubbly, golden brown, crisp cobbler that is likely the easiest dessert you’ve ever made. Serve it up with a scoop of ice cream, and prepare for fireworks!